Paul Atkinson, (latest fruitcake recipient), Chuck Collazzi, (former owner of fruitcake and poker trophy), Gene Meyer, Terry Coultas, Paul Ebert, (Poker Champ 2012), Rudy Hernandez. Click on Buck Meadows Announcing He's Running Again in 2016! Also click on Let's Talk Caribou here or above in blue menu bar. Just click on "Let's-talk-Caribou" above in the blue menu bar. and Caribou Club Album Release at Santa Monica! Below, Caribou Club members Pat, Dennis, Gene, and Paul take in batting practice last Monday, "Opening Day" of the new Dodger's ownership. Also below, Magic Johnson, on the field, explains to the press the long standing relationship between the Dodgers and the Caribou Club. Above, here's Pat Leahy showing off his lifeboat and some Caribou Club apparel on a recent cruise through the Panama Canal with his wife, Lily, who claims that Pat clung to the lifeboat throughout the trip. please email them to Gene or Terry at emails above. Below, Gene, dad Bob, Jeff, and grandpa Jack hang out with the latest edition of John Meyer in Portland. Thank you Jeni Meyer for providing the baby and taking the photo. Celebration of the Centennial of Titanic Sinking! Other members of the Mexico SOS group included Terry Coultas, Pat Leahy, Patrick Meyer, Ahmad Shepard, Maggie Klaus, Alan Somers, and Gene Meyer. 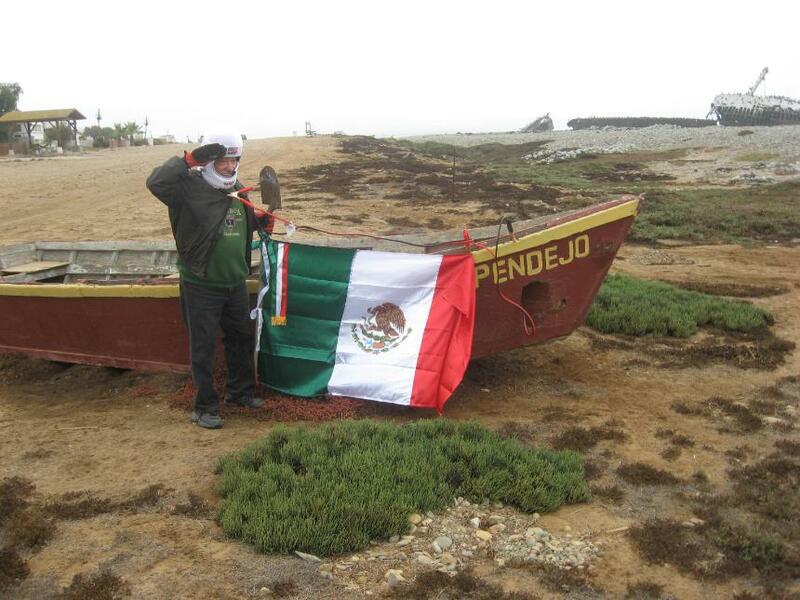 practicing her skills at Shipwrecks in Mexico on a trip earlier this month. Below is Joel Delong, who celebrates his 40th birthday on March 27, pictured with his twin sister Felicia, who Joel says is 42.
located next to Santa Monica Pier, the finish line. Above, papa wolf Bob Meyer juggles cub John Meyer on his lap. This posting March 17, 2012. Where has the year gone? What am I on? In response to the many concerns and complaints we get about not updating this website more often, we can only say sorry, but the staff here at Caribou Club headquarters aboard Perfect (New Page!) don't think about it very much. We have other things to do like fishing, (That's a lie, boat's broken), surfing, playing golf, traveling to Mexico, (upcoming trip in April, 2012), and (for some Caribou Club members), working. But thank you to our ever complaining worldwide audience for tuning in from time to time to see what's happening in the Announcements 2012 section with Coastal Eddy, Buck Meadows, and the rest of the staff here at Caribou Control. And as you can see, we've built quite an archive in this website in the last few years, and that stuff isn't going away. Suggestions? Photos? Threats? How about something from you? Send stuff in. Mike LaRocque's Memorial Page, click Mike's name. 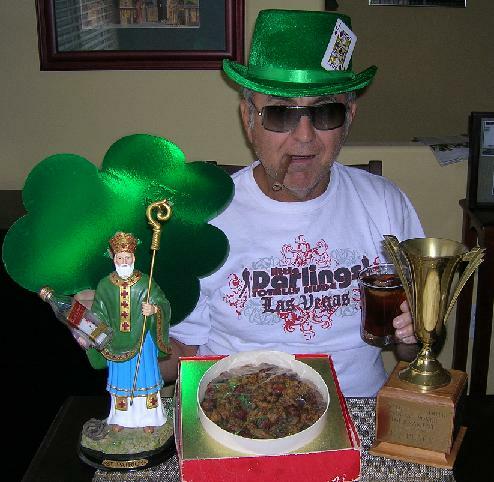 Pictured below and leading off the year in a rare tribute to the Caribou Club and celebrating his birthday, which just happens to be St Patrick's Day, is Chuck Collazzi, surrounded in Las Vegas by some of his most precious possessions, including the Lou Watson Poker Trophy and the Mickey McAdam Memorial Fruitcake. Nice shirt, Charlie. Also like the Jack 'O Diamonds. As for where Buck Meadows will turn up next, check out below as he was photographed this year attending, incognito, a Syrian Freedom Fighters' Civil War training session. and there's way too much lead in the food. Below: John Meyer was born on February 25, 2012 to Jeni & Bob. Proud grandparents Jack and Stephanie Meyer were there at the arrival in Portland. The Caribou Club is taking up a collection to buy the little guy a wetsuit. Pat Leahy checked in this St Pat's morning, and according to info Pat got from Coastal Eddy about Osama bin Laden, it turns out that after living in that compound for five years with three wives and never once leaving, bin Laden actually call the SEALs himself! Who does the Caribou Club endorse so far for President ? Above, if you're asking why the website has not been updated in a while, and why we're not fishing, Terry points to one of the reasons aboard Perfect. At least no one is getting seasick these days. Just for nostalgia, here's Dennis last year. Can it happen again? Below, Jeff wants to show you where we're going in April. or call Jeff or any of us if you're interested in going.